We just found out that this month the great site nyctaper turns 8 years old, happy anniversary/birthday/web-offspring/whatever fellas. 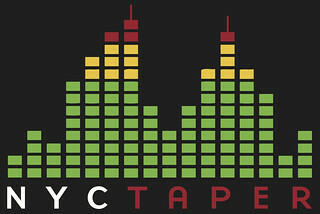 With that we thought it was long past time to check in with the fantastic nyctaper and see their upcoming taping schedule. The site always gets great shows, we had no idea that Yo La Tengo went incognito as the Condo Fucks, but you can check out their most recent set here from when they played Cake Shop. While not the caliber of their Cortez live cover, especially with Doug's odd lyrics change, the music is pretty damn spot on. We may have to go see them next go round. We have always loved Acid Mothers Temple freak out rock and roll but have never got to see them, we can now hear their set though thanks to nyctaper from Mercury Lounge. Hooray For The Riff Raff played our favorite NYC venue, Bowery Ballroom and of course nyctaper caught it. We reviewed the album last year and missed the show...here's a chance to catch up. Finally, one group we really want to see next NYC show is Ex-Hex, we loved their album and nyctaper now has a show from South Carolina to check out the ladies live set. As always keep up the great work nyctaper, and for fans you can support the site through it's paypal account.